When I think of winter, my memories go back to being trapped in the house due to piles of snow outside. With the early darkness due to the tilt of the sun's axis, there was nothing more scary than reading DC's House of Mystery. And who was better at illustrating HoM covers than fear master Bernie Wrightson? 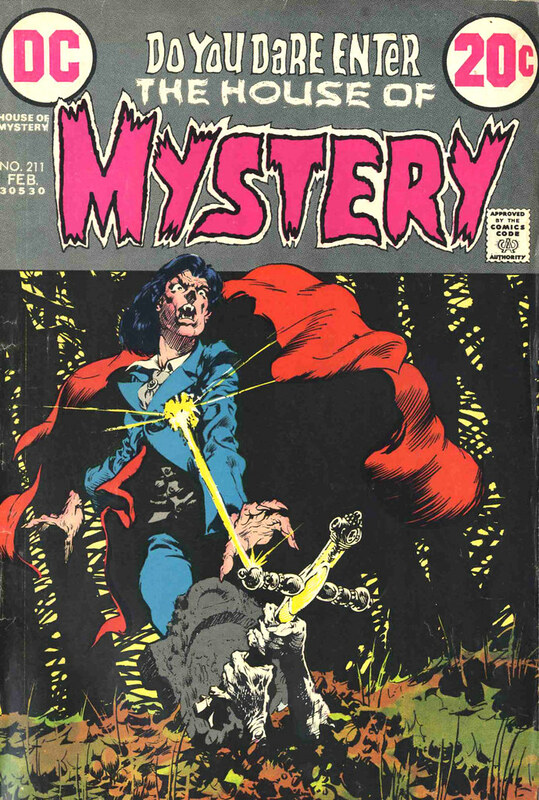 This cover from issue 211 (cover dated Feb 1973) was one of his most inspired: a vampire hit by a holy cross, wielded by skeletal hands from the grave! 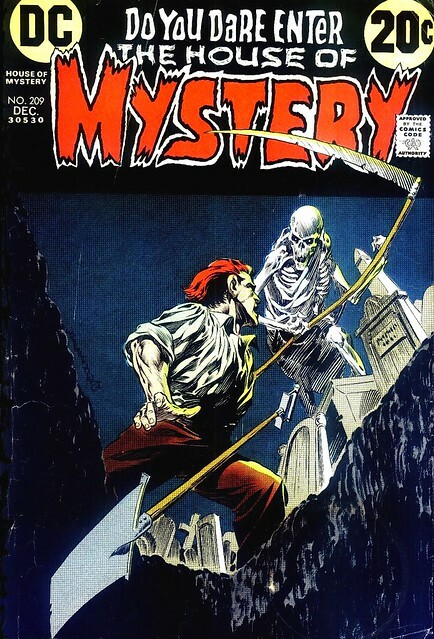 House of Mystery 209 from 1972 featured a gravedigger about to meet the grim reaper. I hope he dug himself a prime location in the graveyard. Wrightson chose a great angle for this illustration, straight from the bottom of the grave looking upward. 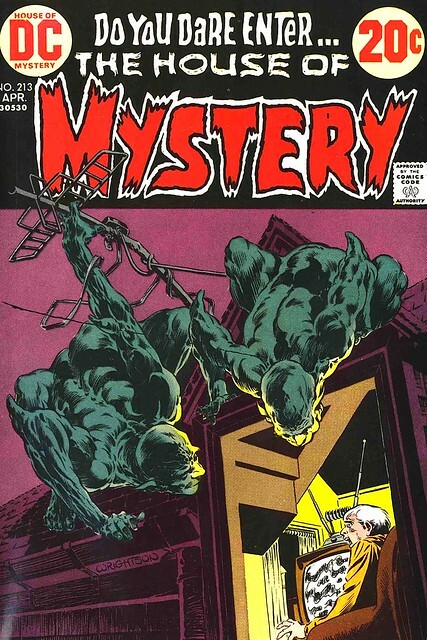 The cover from House of Mystery 213 is one that has haunted me forever. Who doesn't get weirded out by strange noises and pops in the house when you're alone reading or watching TV? Or worse, just at the moment you are about to fall asleep? I always imagine Gremlins out to get me and this cover is the culprit for putting that idea in my head. These two are real nasty goofballs, bending the rooftop antennae and fuzzing out the TV with static. Oh what fun this generation has missed out on--whacking the TV or adjusting the antennae signal to get the best picture! The only frustration they can know is not finding a program on iTunes or finding a Torrent with no hosts. None of the House of Mystery stories inside had much to do with the covers, but they were worth buying just for the excellent artistry of Bernie Wrightson. Nuff Said! Wrightson was one of the first artists that I could recognize just by seeing a piece of his work. I was hooked aftter that. I appreciate all the great stuff you do. Thanks, Cal! I always enjoy reading your blog, too.